Q. In 2008, you won a bunch of tournaments to overtake Roger Federer for No. 1; Novak is doing that this year. Can you compare the two years in terms of Novak's success versus yours? RAFAEL NADAL: Well, he's having better season than what I had in 2008. Nine titles already is a lot, no? I won the Olympics that year, too, so I don't know. Every season is different and is difficult to compare, no? But I think what he is doing is really amazing, and probably impossible to repeat. Just congratulate him, because it's really, really difficult what he's doing. Q. Did you watch the Rogers Cup final? I was wondering if you could talk about Mardy Fish. He always plays well here. If you watched the match, how do you think he played and how do you think he's been playing this year? He's had a pretty good year. RAFAEL NADAL: I didn't. I didn't watch the final, no. He's playing well. I think he improved from few years ago. His mental part a better now. I think he's a very complete player: His serve, his aggressive game is really good, and now he's better able to defend than before. So I think he's doing really well, seriously. Q. Getting ahead in the calendar, are you planning on representing Spain in the Davis Cup final? But if the captain wants me there, I'm going to do it, yeah. Q. What do you need to do to get back on track here in Cincinnati after having an unexpected loss in Montreal last week? RAFAEL NADAL: Play well. I need to practice well. You know, last week in that match I thought I didn't play bad, but I didn't play enough well the important moments and the decisive points. I had too many opportunities to close the match, I didn't, and finally he played really great with determination. So after losing like this, the confidence stays a little bit so-so, especially because I didn't practice a lot during all the summer. I had the problem in the foot after Wimbledon, so I was able to play just -- if we're talking about practice well, it was just three days before I had to fly to Cincinnati -- sorry, to Montreal. So wasn't enough, but that week there before the match, I think I did well. I had a few good practices and I felt competitive before the third-round match. Wasn't enough. I will try another time here. If not, I will try in the US Open. So that's it. For me the season is not done, but even if I am not playing bad the rest of the season, I had a very good season. The thing that remain for me is try to finish well, no, try to finish with good feeling. That's what I going to try. I going to work hard to do it. Not only for this season, for next season, too I have to improve a few things to be really competitive, to keep having chances to win important titles. I want to work on that. Q. What do you think of adding another tournament where the men and women play concurrently? Do you like having the women here at a tournament? What are your thoughts? Is it a different vibe or atmosphere? RAFAEL NADAL: Do you want the true? Q. I want the truth. No sugarcoating it. RAFAEL NADAL: It's different. Seriously, it's difficult to say, because I think it's good for the atmosphere; it's good for the fans; probably is good for the tournament. Is not that good for the players, because -- well, I love to have the women around us. It's not a question of that. It's a question of courts, a question of less space. But this tournament improved a lot. I think they make big improvements with the space, with the players' lounge, with the place where we are having lunch. So that's a big improve, and that makes possible that we are having a combined event. But if you talk about being comfortable for practice court, for everything, I don't say about myself. I am very lucky. All the people is having fantastic words for me, and they are giving two hours of court every day without problems. I just can say thanks a lot to the tournament. But probably for a lot of players, they are having more problems than usual. Q. You joined Twitter in the last few weeks. Talk about what made you decided to do that, and what has surprised you about it so far? RAFAEL NADAL: Well, we decided to start with Twitter. We started with Facebook a long time ago, and that's to be a little bit more in contact with the fans. I like, no? I think it's something different. It's something that can have good fun and the fans can have a little bit more information about what I'm doing daily. So I think that's good. Q. Do you have any superstitious or pre-game rituals or good luck charms that you do? RAFAEL NADAL: Before the matches? RAFAEL NADAL: Well, always cold shower before every match. That's what I did all my life. Not much more. Q. After the tough loss in Wimbledon this year, you said you had to really improve because you played Novak so many times and lost. What specifically do you need to improve next time you play him in order to win? RAFAEL NADAL: Well, seriously, I didn't find the solution yet. (Laughter.) You know, I know what I have to do, but the difficult thing is do it. So I have to play aggressive, without mistakes; I have to serve well; I have to play long, close to the lines. Everybody knows what you have to do to win a match; not everybody knows how to do it. So that's the main issue, the main thing, no? I know I can do it because I did in the past. I'm going to work hard to try to do it in the future. I don't know if I am ready today. I don't know. Maybe yes, maybe not. But what is sure is that I'm going to work hard to be ready in a few months to do it. Q. You befriended Rory McIlroy after he won the US Open. It's been reported that he's in Cincinnati visiting his friend, Caroline Wozniacki. Have you talked to him at all? Have you played any golf when you've been in town? 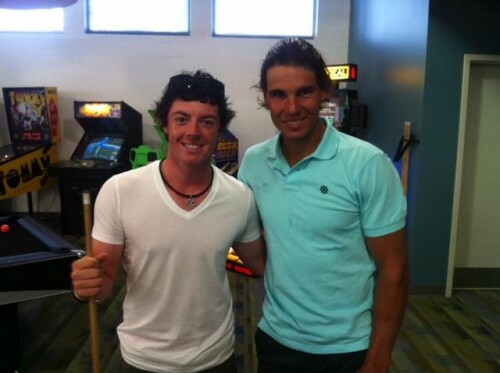 RAFAEL NADAL: I met him last year in the US Open. We keep in touch for that year. I like him a lot. His character and he's a humble guy, very, very normal, very relaxed. I have a good contact with him, and, yeah, he told me few days ago that he going to come here and was a nice surprise. Q. You've had some time off with some vacation and just one match. How important is it for you to get some matches here under your belt before you get to New York to really feel where your game is? RAFAEL NADAL: I would love to have the matches, but you never know. I could come here and lose first round. That's sport. That's tennis. If that happen, I'm going to think positive. I'm going to think I have to practice well to be ready for New York. That's what I going to try. I'm going to try my best to play a good tournament here, but, you know, it's not easy. I never played well here. I never played well during all my career here. Probably this year I am not arriving with the best feelings because I wasn't able to practice a lot at home. During all the summer I had the problem on the foot. I just practiced three days before came to Montreal. I lost an important opportunity, I think, in Montreal, because, you know, after long time without play is important to win the first match. That's the most difficult thing to do. I didn't there, and I had a big chance to do it. So we start another time here. I will try for sure. Q. Are you worried or concerned about your confidence? RAFAEL NADAL: I am worried -- when I won Roland Garros, I am worried about the first round of Queen's. For sure I'm worried about the first round here. I worry about every match on my year. That's the true, no? Every match is important. When you practice a sport, when you compete at the highest level, you have to understand and you have to accept that every time when you go on court you can win and you can lose. That's part of the game. That's the toughest part of the game. But at the same time, it's the really beautiful part of the game. If you don't lose, you cannot enjoy after the victories. So I have to accept both things. I'm having a very good season. If I lose here another first round, accept that and accept that I am having a fantastic year and I am having a fantastic last seven years in my career. It's impossible to be all the time in semifinals and finals in every tournament of your career. That's not going to happen. Try to make it possible as many times as I can, but is impossible every time. Q. Changing topics, it's going to be the tenth anniversary of September 11th during the US Open this year. Talk about your memories of that day and where you were. RAFAEL NADAL: I remember exactly what I did that day. I was playing a match to win my first point ATP, and I lost that match with 13 match points. So that's the true. Just after that match I saw the tragedy at TV. Just, you know, I was really sad about my match, because the first point ATP always is really important. But when I came back to the locker room and I saw that on TV, I really forget the match in one second, no? I was there in the twin towers few months before, in the top. On the TV, that's probably one of the views that had bigger impact on myself. Q. There's a yellow Aston Martin that has Vamos, Rafa on it. It's been in the parking lot. I don't know if you've seen it. If not, what are some of the crazier things that fans have done to show their support for you? RAFAEL NADAL: The car? I saw that in the picture. Last week I saw that in the picture, and I will met them. Q. You will meet them? Q. They'll be very happy. RAFAEL NADAL: I have to do it when somebody brings Aston Martin like that, I have to met. I just can say thanks to them for the support. Q. The tournaments are different, but Monte-Carlo you've won the tournament like nine years in a row. RAFAEL NADAL: Eight. Nine is -- even I don't have nine years in my career. Q. Is there anything mentally you can do to increase your chances for success here? Pretend you're in Monte-Carlo for instance, even though the surfaces are different, that sort of thing, to do better here? RAFAEL NADAL: I try my every year. I try my best in Monte-Carlo. I am not trying better in Monte-Carlo than here. Q. Is it just the surface difference then? RAFAEL NADAL: I don't know. Maybe it's the part of the season. Maybe it's the surfaces. Weather conditions. I don't know. But the true is I never went far away from the semifinals. I played two times semifinals? Q. Semis. Never made the finals here. RAFAEL NADAL: No, no, for the sure the finals not, but semifinals I think I lost against Novak once - two against Novak maybe. Q. Have to check it. RAFAEL NADAL: Doesn't matter. The true is, even if I play semifinals or quarterfinals, I never played well. It's something in my mind that I have to change. I hope win first round here and I will be able to play with a little bit more confidence. After that, you never know. Why not this year I play well? I always thinking positive.